After weeks of relatively calm box office battles, the first weekend of November brings us an old-fashioned slugfest, with two films going head-to-head and a potential spoiler lurking in the midst. I think it'd be interesting if you brought mid-1990s Tim Allen, flying high on the wings of one of the hottest sitcoms in the land, to 2006, where he's stuck remaking old Dean Jones movies, and seeing if the whiplash would break his brain. I suppose at least he's working. He's got one pretty reliable franchise, though. The Santa Clause sees its third outing hit theaters this weekend. Like the first two films, this movie hits theaters well in advance of Christmas and even Thanksgiving, repeating what has been a winning strategy so far. The first film in the series earned $144 million 12 (count 'em) years ago, while the second opened to an astounding $29 million four years ago. That's a lot of money for dressing Tim Allen up in a fatsuit. The Santa Clause 3: The Escape Clause ups the annoyingness factor by bringing in Martin Short as Jack Frost, who's trying for a hostile takeover of the North Pole. Personally, the job seems like a giant hassle, but to each their own. However, this has been a reliable family film franchise from the past two outings, and I see no real reason to doubt that this will continue that trend. It looks more or less the same quality of the last two films, and we'll continue to be treated to more of them every few years or so until one of them flops entirely or Allen's caught with his pants down on a street corner. Look for it to win the weekend with about $28 million. Going head to head against this in the family film market is Flushed Away, the latest outing from Aardman Animations, and one of Hugh Jackman's 87 films released this year. Jackman stars as a posh pet rat that, per the title, gets flushed out of his comfortable lifestyle into the London sewers. He then must journey back to his life while dealing with the crazy cast of characters that already reside there. Aardman is the studio famous for bringing us the films of Nick Park and Peter Lord, including Chicken Run and the Wallace & Gromit films. 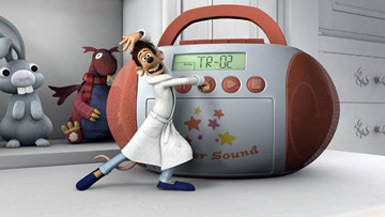 Notably for Flushed Away, they've moved away from plasticine stop-motion animation for digital work, though they've retained the same look and style. While purists may be up in arms about this decision, it is reportedly not because of the interference of DreamWorks, but due to the fact that since this film features so much "water", it would be cost prohibitive to animate it in their traditional fashion.